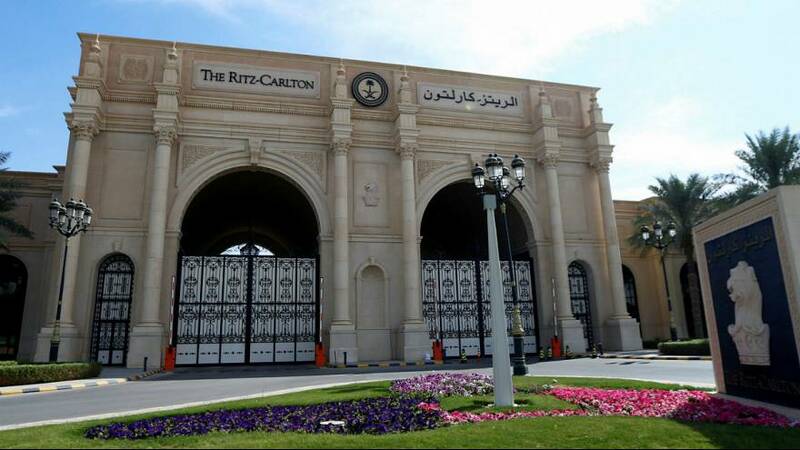 Former government ministers, prominent businessmen and members of the Saudi royal family that were arrested in an anti-corruption crackdown were being held at the luxury Ritz-Carlton Hotel in Riyadh, it’s emerged. The five-star hotel in Saudi Arabia’s capital hosted more than 30 of the country’s most senior figures after the high-profile “prisoners” – among them blood relatives of senior rulers – who were brought in on buses from 11 pm on Saturday evening (November 4). They are the highest-profile prisoners in the modern kingdom’s history and despite accusations of high crime still appear to be maintaining their luxury lifestyles. The arrests were led by Crown Prince Mohammed bin Salman after his father King Salman bin Abdulaziz al-Saud announced the formation of an anti-corruption committee on Saturday. A video said to have been shot yesterday (November 6) shows the hotel’s Ballroom B with makeshift bedding in place, and what appear to be guards on duty. Also pictured was an assault rifle leaning against a wall. The luxury treatment of the prisoners is linked to the tribal hierarchy deeply engrained in Saudi society, by which insulting a senior figure or family patriarch would have far-reaching consequences. “He couldn’t have put them in the jail and he would have known that. So this was the most dignified solution he could find,” said one senior official. Why is Al-Ula paving the way towards tourism in Saudi Arabia?